I sure love me some SPF. You can bet that nine times outta ten, you'll find me lurking around the cosmetics counters bothering those poor clerks with a "Um yah, now does this have SPF in it?...Well can I custom add it?" The thing is, is that I'm dreadfully terrified of wrinkles. After many discussions with dermatologists (and those over 40 with to-die-for skin), I've come to the conclusion that it's a mix of washing/moisturizing, not rubbing, and sunscreen that will put you on the road to supple city. Not rocket science. So you won't be surprised by the fact that I'm drooling over this steal of a deal bracelet. 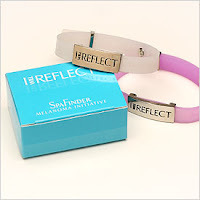 SpaFinder has released a Melanoma Bracelet ($4.95). There's no longer a reason to claim that you didn't know the sun would give you cancer, or that you didn't know that overcast skies still means danger. The color of the bracelet changes as you are exposed to harmful UV rays. With one of these little arm charms, you can be responsible AND cute as you move your little booty further under your beach umbrella. i wish i had one of these when i was in west africa b/c i swear... everyone has told me that since i came back i look like im 30! I blame it on those harmful UV rays! woah woah, i'm soooo gonna need one of these pretty soon.